ABSTRACT: The Eromanga Sea is an epeiric, epicontinental seaway that dominated the eastern Australian landscape during the Cretaceous. Previous geodynamic and surface processes models have attempted to simulate the evolution of this seaway, but its spatial and temporal characteristics have yet to be accurately reproduced. In particular, the combined effects of tectonic and dynamic topography through time have not been considered in this context. This study aims to link deep-seated processes that drive topographic change across the Australian continent to global sea level change, erosion, sediment transport and deposition since the late Triassic. Through this, we attempt to better understand the evolution of the Eromanga Sea as well as eastern Australia more broadly in a tectonic, geodynamic and surface processes framework. The primary objectives are to generate continental-scale, landscape evolution models that predict the northern drainage of the Eromanga Sea during the Cretaceous, and the southern drainage of the Murray-Darling Basin at present-day. Plate tectonic reconstructions are applied to drive forward geodynamic models to model the time dependent contribution of mantle flow to surface topography. This predicted dynamic topography is coupled with temporally and spatially varying tectonic and surface processes parameters to generate landscape evolution models of the Australian continent. A variety of initial and boundary conditions are tested and refined to place new constraints on the evolution of this large inland sea. These include the paleotopography of the Australian continent during the late Triassic, the magnitude and distribution of tectonic and dynamic topography following Pangea break-up, the variability of precipitation and erodibility across the Australian continent and the combined effect of these parameters on erosion, sediment transport and deposition through time. Iterative model refinement leads to a magnitude scaling of the preferred dynamic topography model by 0.65, a variable erodibility grid considering major erodibility differences across the Tasman Line, and an initial topography that incorporates the uplifting influence of the African superswell on the elevation of western Australia throughout the mid-Mesozoic. 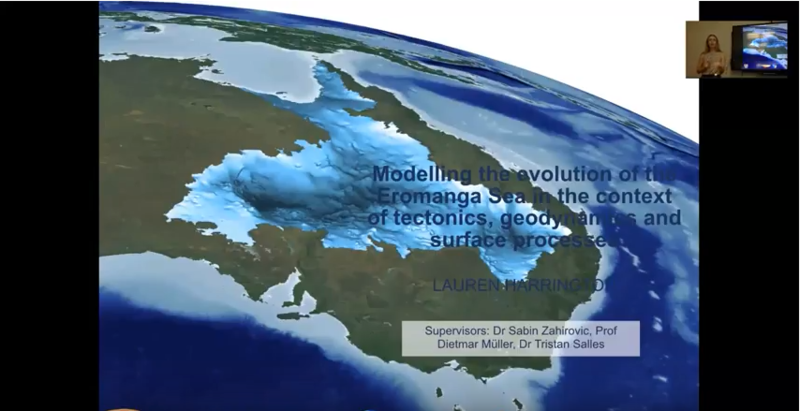 Our models reproduce the northern drainage of the Eromanga Sea without a connection to the embryonic Southern Ocean, as suggested by geological observations, through the inclusion of an Australia-Antarctic rift shoulder during the late-Cretaceous. To facilitate the southern drainage of the Murray-Darling Basin in the late Cenozoic, the rift shoulder needs to be sufficiently eroded, thus constraining both its initial elevation and its erodibility. In this way, we are able to constrain the previously unknown Australia-Antarctic rift shoulder elevation to a preferred value of 100 m ± 50m. Importantly, this study also presents a new and transferrable workflow for the development of continental-scale landscape evolution models. Applied to any region of interest, this workflow facilitates greater understanding into landscape dynamics and provides a means to constrain the multitude of mechanisms influencing surface processes through time.